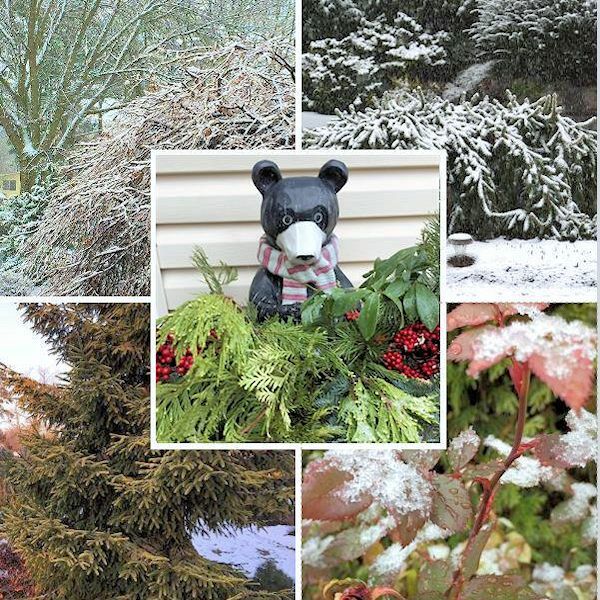 Welcome to Garden Bloggers' Bloom Day and Foliage Follow-Up for the month of December. 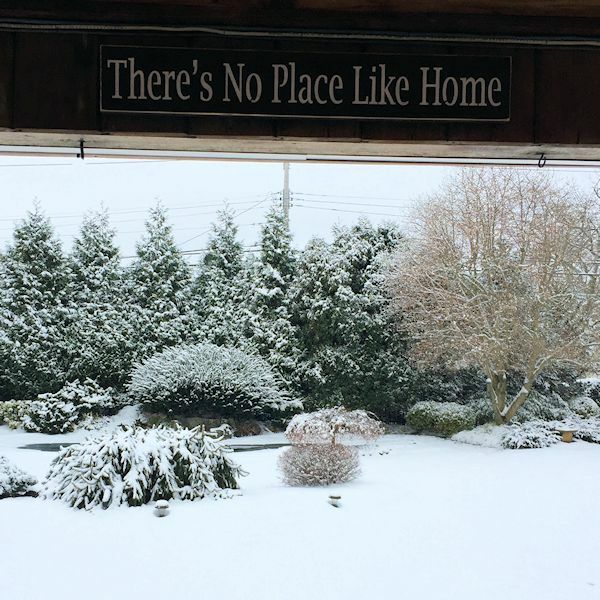 After a relatively mild November, winter has arrived in the northeast with temperatures in the 30's-40's by day and 20's-30's by night, with a layer of snow covering our Long Island garden. The first snowfall arrived on the 9th with just enough covering to transform the landscape into a winter wonderland, with a refreshing on the 14th. At this time of year, it's all about colorful evergreens, texture and structure. Join me for a stroll to take in the view! 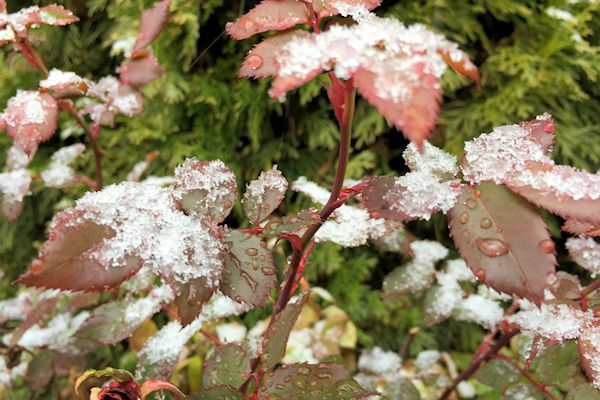 With the milder than usual temperatures, the rose bushes had still been pushing out new foliage, which is now covered with crystals of snow. 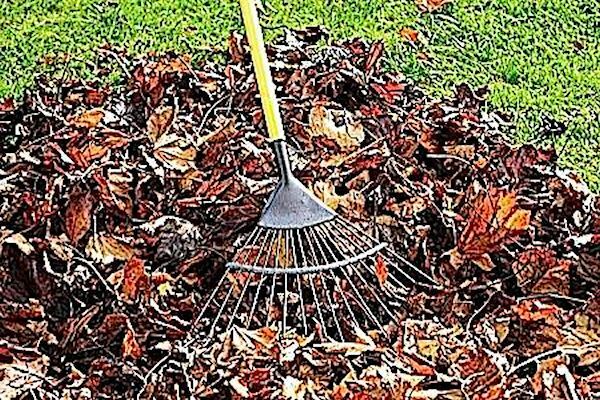 Many of the deciduous trees and shrubs had just recently lost their leaves within the past couple of weeks, with some still not ready to fall. 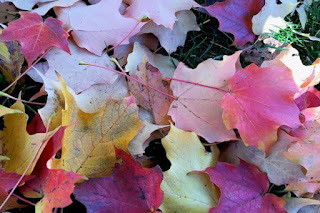 The seasonal changes have been noticeably behind by about three weeks until just recently. 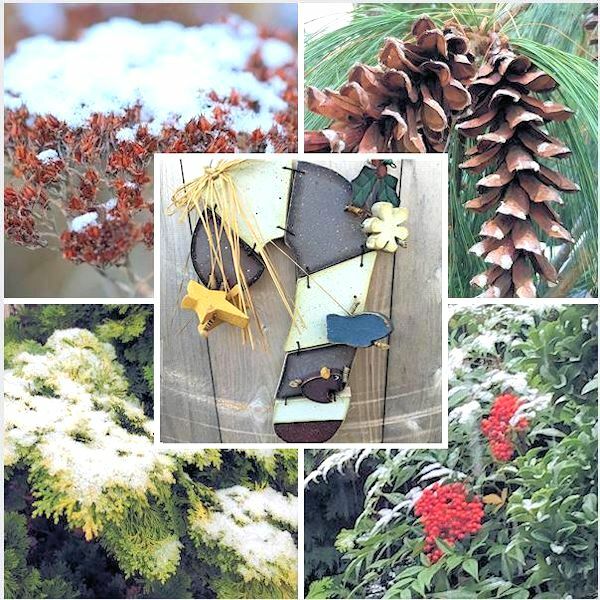 Evergreens are in the spotlight during December. 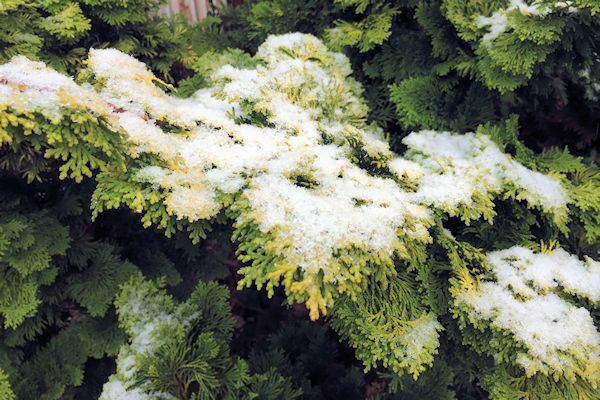 Here is Juniperus 'Gold Lace' with its graceful golden branches all covered in snow. Montgomery Blue Globe Spruce never ceases to amaze me with its vibrant blue foliage, that seems even more prominent during the late fall and into the winter months. The ice crystals make the shrub "glow" even more in the sunlight. In the pool garden is Weeping Norway Spruce (Picea abies 'Pendula'). Behind it on top of the rock waterfall are spreading yew and to the left are Hinoki Cypress 'Nana', which reach a height of only about three feet tall at maturity. I often leave the dried seed heads of Sedum 'Brilliant' a little longer so that birds can enjoy them. 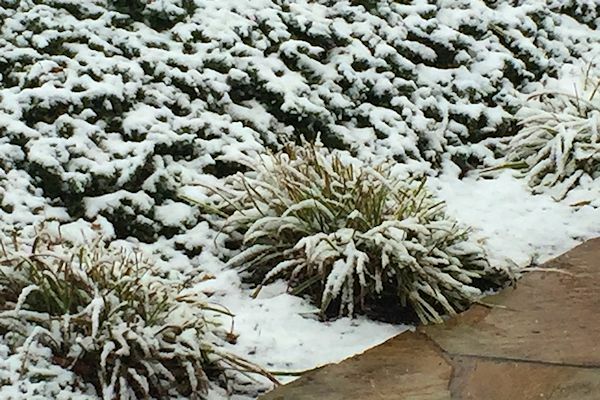 They also look nice when snow covered, which adds interest to the garden. 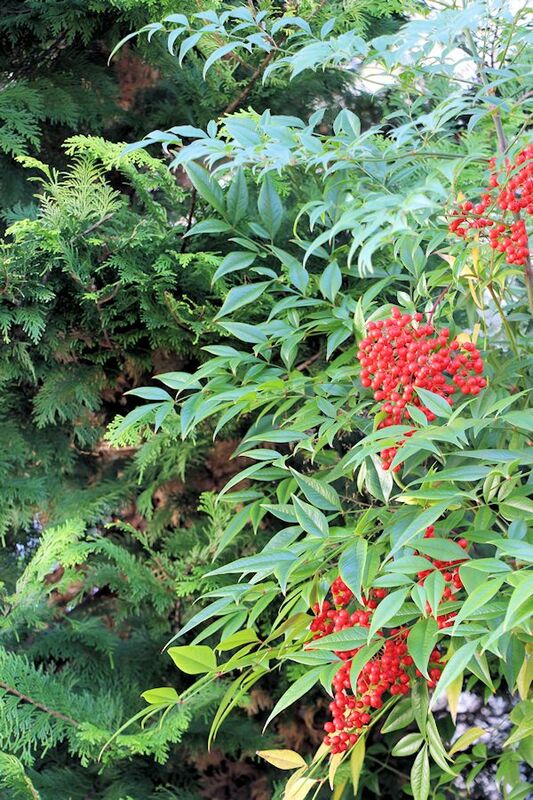 Towards the northern area of the property is Nandina domestica, also known as Heavenly or False Bamboo. It is a clumping variety (non-invasive in our area) and the interesting looking foliage remains semi-evergreen over the winter. I have read recently from studies that the berries may be harmful to wildlife if eaten in large quantities. While I have never seen any sign of birds going near the Nandina, I still remove the berries as food supply becomes scarce and continue to enjoy the lovely foliage. 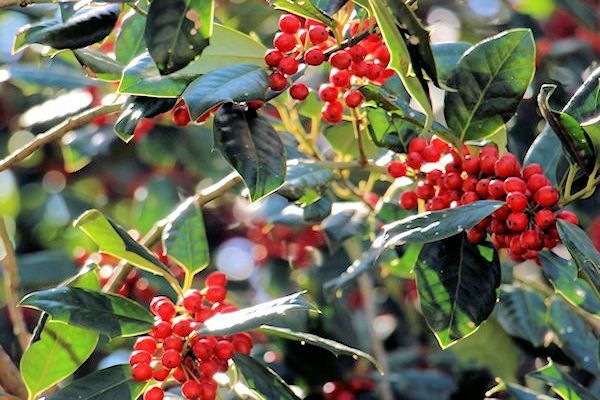 Another berry producing plant in the garden is Holly 'Nellie Stevens'. The berries are a beautiful bright red against dark green shiny leaves and make an excellent food source for birds for a good portion of the year. 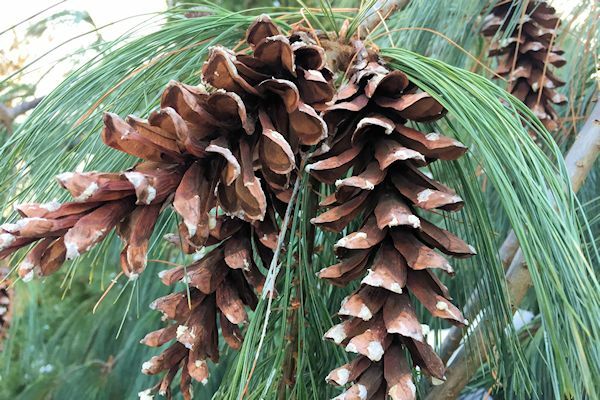 Weeping White Pine is showing off its large seed cones. I really enjoy nature's artwork as the cones are in varying shades of brown with white accents. In the driveway entry garden, Coral Bark Maple and Weigela 'Spilled Wine' have lost their foliage, leaving evergreens to take on the role of supplying color. 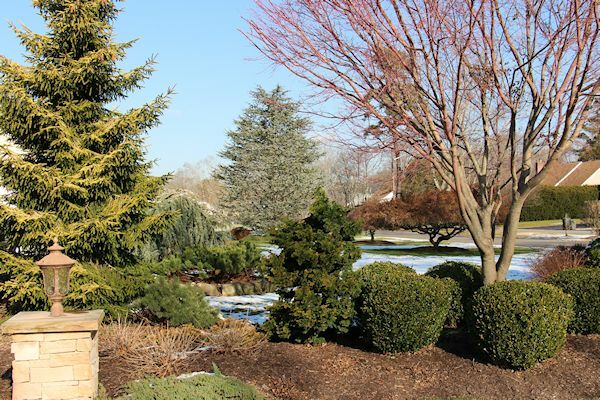 Here are Skyland's Oriental Spruce (to the left), Hinoki Cypress and Boxwood (to the right) and Blue Atlas Cedar (in the distance-center). 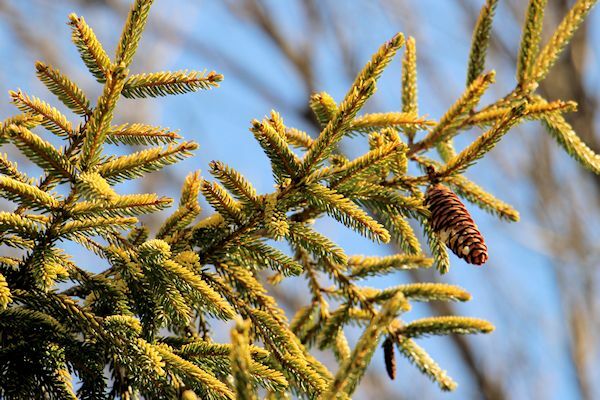 The female seed bearing cones of Skyland's Spruce start off purple in spring and mature to a deeper brown by winter. 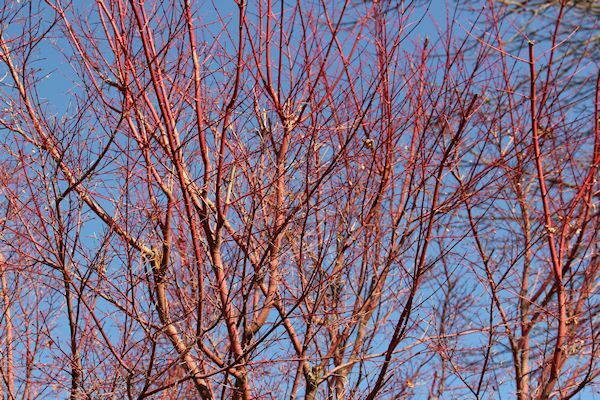 Coral Bark Maple 'Sango Kaku' is starting to show its glowing coral-red bark as the temperatures fall. Generally, the lower the temperatures, the more brilliant the tree. 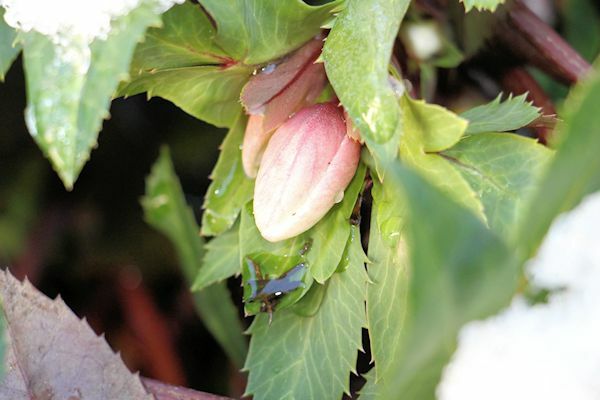 In the northern garden, Hellebore 'Shooting Star' is developing buds that will open in a month of so. Recently added is Hellebore 'Dark and Handsome', which was planted just this past summer. The goal is to add more interest to the winter garden and have more to look forward to. I am not sure about getting blooms this season, so I'll have to wait and see if it produces any buds. Along the patio (left to right) is Colorado Blue Globe Spruce, Weeping Norway Spruce, Blue Star Juniper and Dwarf Fountain Grass, the later being done for the season. Along the fence are the snow tipped remains of hydrangea blooms. 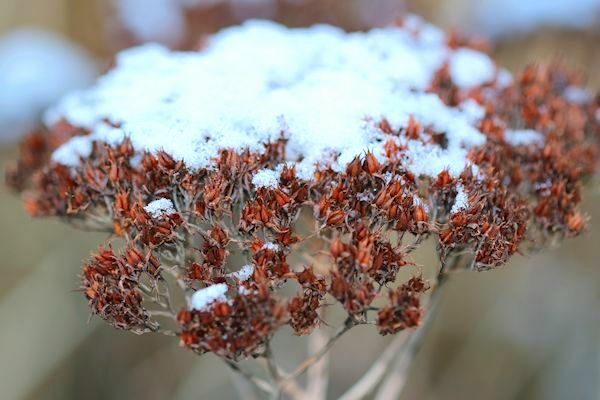 The flower heads will eventually disintegrate over the winter, but add interest for now. 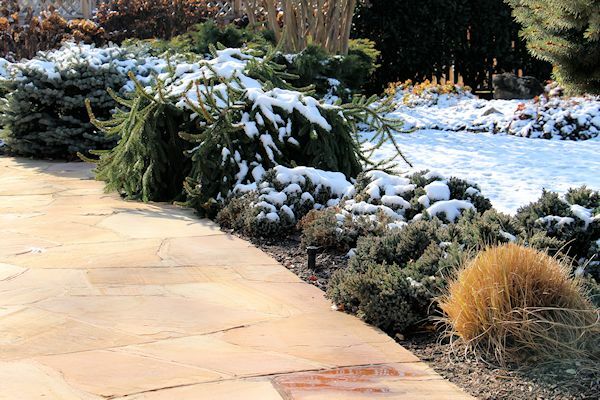 Here is a snowy view of along the front walkway with Variegated Liriope and Japanese Garden Juniper, topped with a tinge of white frosting! 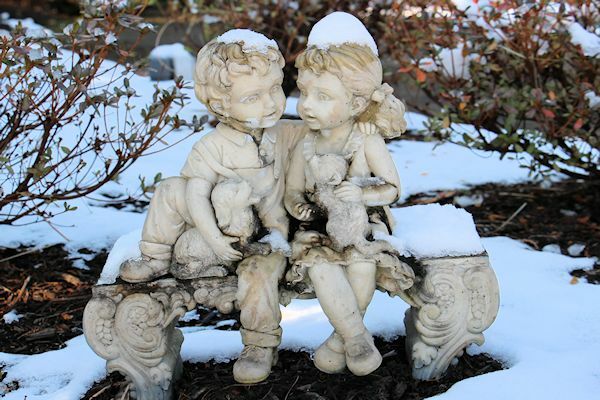 At this time of year, even gardening boy and girl look cold with piles of snow upon their heads! I love the garden throughout all the seasons, each month of the year bringing something new to look forward to. No matter what the time of year, whether spring, summer winter or fall, the garden is my sanctuary...a place of thoughts, dreams and sweet memories. Being that this is the last Bloom Day and Foliage Follow-Up post for the year of 2017, I would like to extend a sincere thank you to you, for being here throughout the year, with best wishes for a beautiful and peaceful holiday season. There's more to come with 'This Month in the Garden" on the 1st to bring in the new year, and a 2017 Gardening Year in Review on the 7th! I hope you enjoyed this month's tour through my garden. Special thanks go out to our hostesses Carol at May Dreams Gardens, who makes it possible to see blooms on the 15th of every month with her meme Garden Bloggers' Bloom Day and Pam at Digging for hosting Foliage Follow-Up. I am also linking with some other wonderful hosts and hostesses at Floral Fridays, Macro Monday 2, and Nature Notes at Rambling Woods. 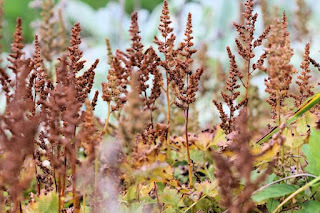 Also check out Garden Bloggers' Foliage Day at Creating my own garden of the Hesperides, Wednesday Around the World, Dishing It & Digging It and Image-in-ing weekly photo share every Tuesday. Author: Lee@A Guide to Northeastern Gardening, © Copyright 2017. All rights reserved. It has been a spookidly warm autumn but do not be lulled into a false sense of security; irrespective of what went before, winter brings wild winds and cold weather. So late autumn is a good time to take some elementary, precautionary measures. In doing so, come spring, you and your garden will be ahead of the game. It is worth pondering the fate of birds and insects in your garden during these inhospitable months. 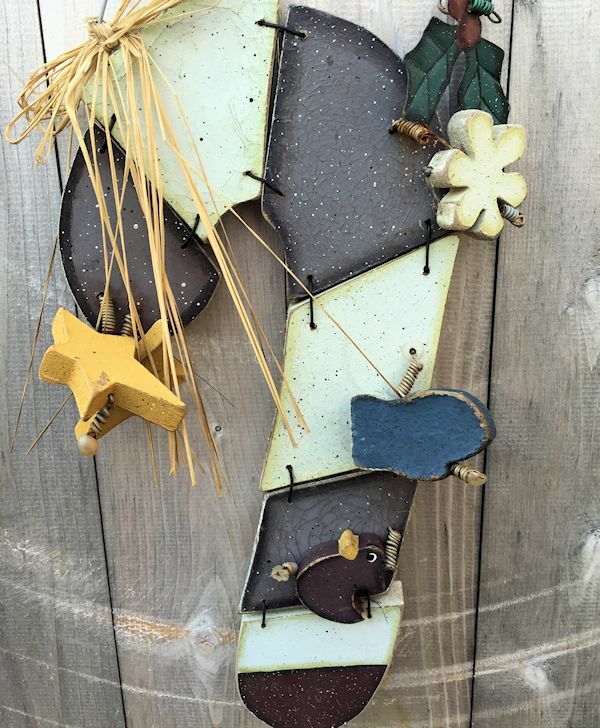 Keep the water in your birdbath clean and topped off, ditto the bird feeders. If there is a quiet spot out of sight of tidy-minded passers-by, you could consider making it hibernation city. Just collect old logs, bundles of sticks, leaves and branches into an untidy heap to encourage hibernating wildlife. This heap will then act as a magnet for pollinating insects and pest predators. At the end of winter, they wake up and supplement the population of good guys in the garden. There is also cutting down and tidying to be done. 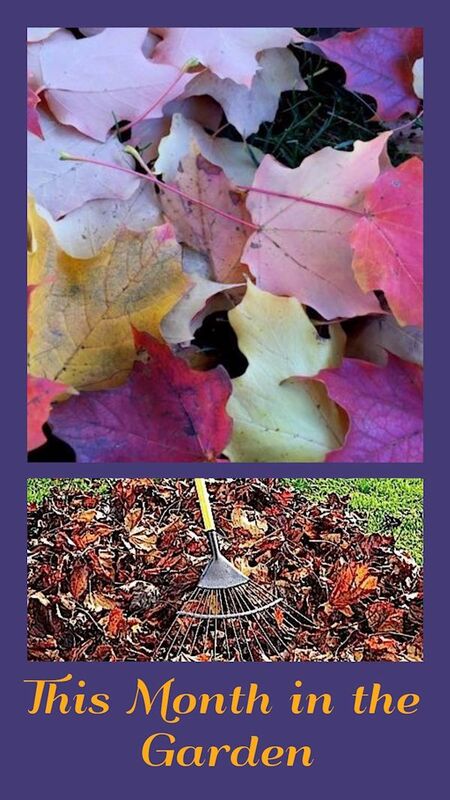 Most urgent is to rake up leaves that make paths slippery and kill patches of lawn. You might want to think about pressure washing concrete/stone paths – they may become slippery if you don’t. Small leaves from deciduous trees can be put in a heap where they turn into leaf mould. Rose and fruit tree leaves tend to harbour disease and need to be binned or burned. Any structural shrubs or trees which have grown wayward branches need pruning back into the shape you want. Branches should not cross, otherwise they may rub and create a wound. At the same time remove any diseased, damaged or dead growth. 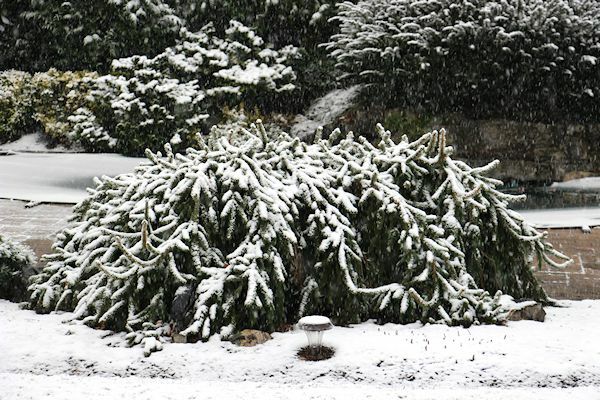 Never prune when the weather is freezing or when sub-zero temperatures are expected within 48 hours. Subject to this overriding rule, hedges can have a very tiny trim where they have sprouted before the frosts come, but allow enough time for new growth to harden off. While you are clipping your hedging, whenever your arms get tired, have a little weeding moment at the base. 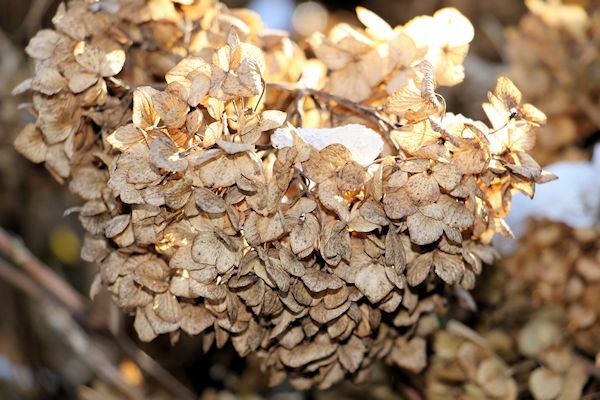 Cut back perennials that look lost and faded but keep the ones that look good shrouded in frost. Compost all these trimmings, but before you do so, empty your compost bins of last year's well-rotted compost and use that on the beds once you have cut everything back. The soil looks much better with a layer of black compost as mulch, weed suppressant and joy for worms all at the same time - how is that for multi-tasking? Cut large rose bushes back by about a third. Don't bother with careful pruning, if you have lots you can do this with a hedge trimmer. Proper rose pruning happens in early spring. This quick 'haircut' is to reduce the chance of your roses being rocked around by the winds. Stray shoots from climbers and ramblers should be tied in while they remain pliant. 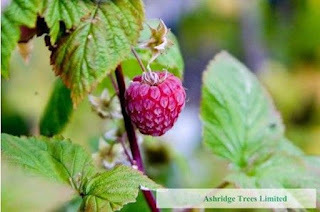 Soft fruit bushes (such as currants and gooseberry) will need pruning as well. This is a fair-sized topic that you can find a good article on the subject here which will guide you through the intricacies of old and new wood and fruiting spurs. While speaking about fruit, nothing will ripen any further so any remaining fruit on the trees should be picked and stored, fed to the birds, or composted. Some fruit trees will need pruning in winter. The golden rule here is you can prune any fruit that has a pip (apples, pears etc) and you cannot prune any fruit that has stones (plums, cherries etc). While you are there, check stakes and ties on your trees to prevent strangulation and apply tree grease. November is the best time to prune walnut trees- they bleed less. 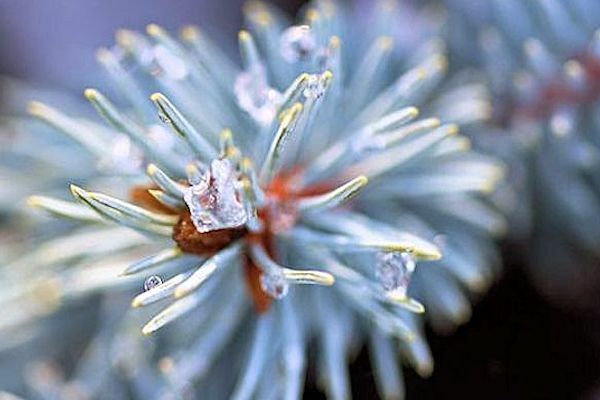 Evergreens are the ones to watch in winter. They continue to transpire and need watering if young or newly planted. 3 cm (1.18 inches) of rainfall a week is necessary, and you need to supply the shortfall. It is the drying wind that is so pernicious. A protective, temporary barrier will stop this. Such a windbreak is an idea for any newly planted hedge in an exposed position. Pots can be planted with pansies, ornamental cabbage and dwarf boxwood for winter interest. Any pot that you leave outside which is not truly frost proof may need wrapping in bubble wrap in severe frosts. The virtue of all this tidying is that you actually get to see your fences/ trellis/ greenhouse again, presenting the perfect opportunity for repairs, cleaning of glass (don't forget the roof), seed trays, application of wood preservative to exposed timber and decking-and crucially clearing leaves from gutters and down-pipes. If these empty into water butts then these should (I know, I know) have an annual scrub to remove algae. Winter is the time because they have a chance to fill again before dry weather next year. Outdoor furniture needs to be taken indoors or wrapped with tarpaulin. Genuinely outdoor furniture can be titivated with a clean and, where relevant, a generous application of reviving teak or furniture oil. Machinery can be serviced and tools oiled and sharpened before being put away. All that is done you can go inside and, instead of putting your feet up, start wrapping Christmas presents! The contributing author of this article, Julian de Bosdari is a garden writer and owner of Ashridge Trees, a UK based gardening site that specializes in hedging and hedging plants. The site is full of valuable information, and if your visit their advice page, you will encounter numerous articles on all facets of gardening.